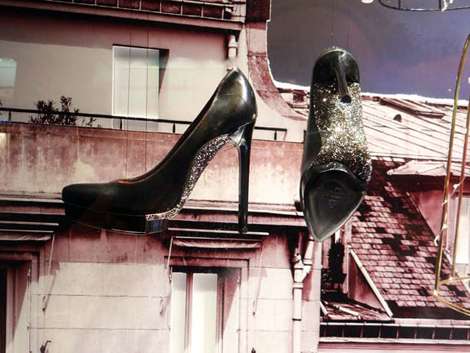 Retail Remedy: Le Bon Marche with beautiful shoes above the Paris sky… oh my. 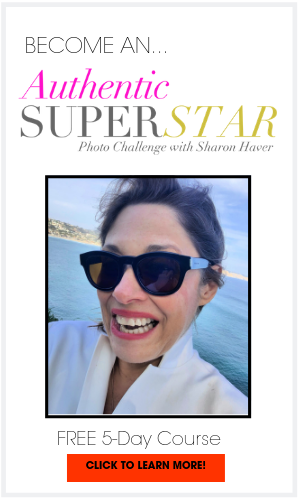 Richard Nahem brings us more Paris Holiday Windows… no airline ticket required! With a more subtle approach, Le Bon Marché has done tastefully appointed windows that show off luxury in an understated way. Gold birdcages decorated with twinkle lights have dazzling evening shoes, jewelry, and handbags inside with doves flying along side. 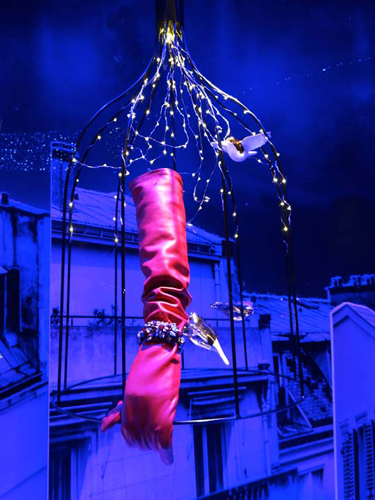 Other windows have 3-D backgrounds of the Rive Gauche including rooftops of Haussmann buildings, the Eiffel Tower, and Musée d’Orsay, all to celebrate the 160th anniversary of the store. Did you like my Paris Holiday Windows 2012 series? Wait till tomorrow for a very special Christmas treat.